It might have been easy to mistake Rotherham United head coach Paul Warne for Pep Guardiola on the touchline at the Etihad but it was rather easy to tell the difference between their two sides on the pitch. In this FA Cup third round tie, the gulf in quality ultimately told. Manchester City were able to strike early and see off their Championship opposition with relative ease. Raheem Sterling scored City’s first in the 12th minute and from there the hosts were in control of this tie. Given that Rotherham have failed to win away from home this season, it was always going to be a tough ask to make it to the next round here against such formidable opponents. There was a moment, however, when the stewards near the touchline were about to point Warne towards the home dugout such is his resemblance to the City head coach. Beyond the bald heads, designer stubble, dress sense and trim physique, Warne also harbours Guardiola’s approach to the game. So much so that fans have started calling their team the Thrillers rather than the Millers. Since Warne became coach, caretaker initially, in November 2016 after Kenny Jackett resigned, Rotherham have been down to the third tier and promoted again. The position he found Rotherham when he took charge was a fraught one, sitting bottom of the Championship with seven points from 18 matches. “It was horrendous,” Warne described. Since then it has been a steep learning curve for the former Rotherham player who was unsure about how to address today’s game; “I am caught between a rock and a hard place. I’m caught between ‘look, let’s just have a right go and give the supporters something to be proud of’, and another part of my brain thinking ‘I don’t want to be humiliated’, a 10-0 perhaps.” In the end, the events rendered to the latter. There was plenty of fight and courage from Rotherham but ultimately a lack of cutting edge. This was always going to be a respite for a team currently hovering above the Championship relegation zone, a trip to face the current Premier League champions doesn’t befall every coach and club and this was more an experience than anything else. City’s depth was shown when Guardiola made eight changes to the team that started against Liverpool on Thursday evening and their strength was barely affected. How the midfield three of Phil Foden, Ilkay Gundogan and Kevin De Bruyne were going to combine was one of the intriguing questions surrounding the hosts. Warne only made three changes to the side that beat Preston on New Years Day and they centred around the defence. 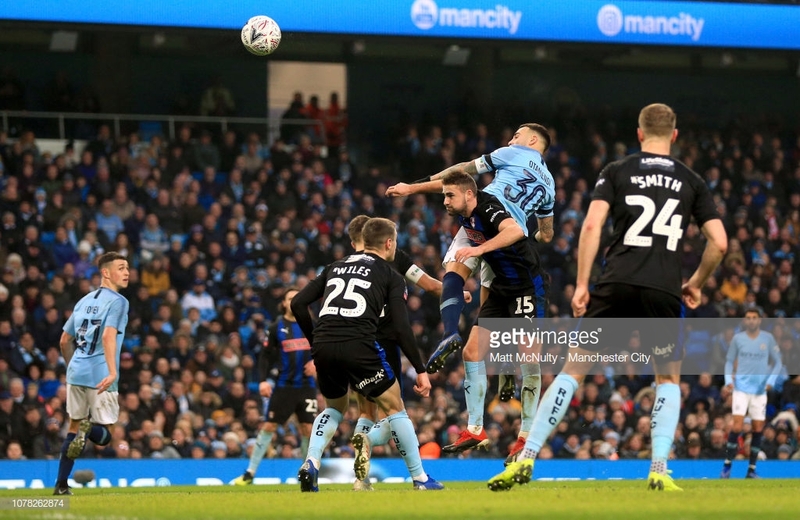 The amendments to Rotherham’s backline did not prevent them from conceding seven goals as City managed the most emphatic victory of Guaridola’s reign thus far. Sterling – one of the remnants from Thursday’s tussle – opened the scoring in the 12th minute, after De Bruyne found him with understated ease; it was the hosts’ fifth major opening of the match already. Rotherham would have gone into the break encouraged having been relatively expansive compared to most of the sides that have faced Guardiola’s team this season, but two late goals ensured that Warne had to adjust his team talk to limit the embarrassment. City’s second was rather lucky, it certainly didn’t resemble the purist football that the head coach demands. Gundogan’s sand wedge of a pass was met by a stray touch from Foden which fooled goalkeeper Marek Rodak. The third was an own goal by Semi Ajayi as he inadvertently provided the final touch when trying to deny Sterling a tap-in. In the second half, Gabriel Jesus eventually got his goal after Sterling gift-wrapped the opportunity. The Brazilian wracked up plenty of chances in the first half but his lack of conviction and confidence was apparent once more. A tucked finish from Riyad Mahrez followed in the 73rd minute following a Gundogan cutback. It was a bullet header from Nicolas Otamendi that gave city their sixth before Leroy Sane came off the bench to finish the scoring off with a shot five minutes from time. Guardiola removed De Bruyne with the game long won, a relief to Warne and the Rotherham players. They had tried but failed to tame a beast that was purring; they themselves were luckless and hapless. City meanwhile were emphatic.